Everyone is unique in terms of eating habits, dietary restrictions, and allergy concerns. This is why, at Benvenuto's Italian Grill, we're dedicated to accommodating special diets. Our diverse menu selections offer gluten-free and low-gluten options as well as meatless and low-carb dishes. Given this, we're confident we'll have something for anyone who comes to our gluten-free restaurant in Fitchburg. Because of our dedication to the premium quality of our food and service, many customers keep coming back to our gluten-free restaurant in Fitchburg. Our gluten-free menu consists of pizza, pasta, sandwiches, and entrees, which are all approved by the Gluten Intolerance Group and by a licensed Wisconsin dietitian. Should you decide to take this dietary path, our gluten-free restaurant in Fitchburg is just the place to enjoy healthy food. On top of everything, you want the quality of the food you are served to be top-tier. A superb gluten-free restaurant in Fitchburg does not compromise, especially when it comes to serving delicious food. At the same time, that gluten-free restaurant in Fitchburg makes sure that their food is not only a delight to the senses but also a source of nutrition. Scrumptious food is no good if eating it means you are endangering your health. Cleanliness should be one of the first things you require from a gluten-free restaurant in Fitchburg. When you visit a gluten-free restaurant in Fitchburg, inspect the dining space. Is it well-maintained? Do you find any food stains on the floor, looking like they've been there for months? Are the tables and chairs in the dining space clean? What about the restrooms? If a gluten-free restaurant in Fitchburg has a dirty dining environment, that's an automatic red flag. You want to be able to enjoy great food without the risk of food poisoning or other dangers. Great food is only one of the many defining traits of a good gluten-free restaurant in Fitchburg. The customer service a gluten-free restaurant in Fitchburg provides is also something you should take into account. At a good gluten-free restaurant in Fitchburg, the staff members are always close at hand but never in the way. Excellent servers at a gluten-free restaurant in Fitchburg maintain a good and friendly attitude from start to finish. You can also turn to these servers at a gluten-free restaurant in Fitchburg when you have questions about the cuisine or need recommendations to their menu items. An exceptional staff will work hard to make sure your experience at their gluten-free restaurant in Fitchburg is enjoyable and comfortable. The perfect atmosphere in a gluten-free restaurant in Fitchburg can spell the difference between a mediocre and extraordinary dining experience. 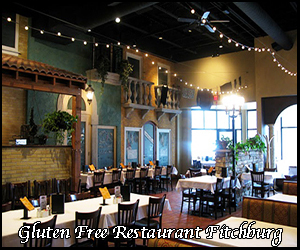 If you are visiting a gluten-free restaurant in Fitchburg to have lunch or dinner, a soothing and relaxing ambiance is ideal. If you are hosting a corporate function or a formal family event, you want the gluten-free restaurant to be comfortable and just the right amount of elegant. Are you in the mood for traditional Italian cuisine? Satisfy your cravings at Benvenuto’s Italian Grill. We have mastered the art of cooking traditional Italian dishes that are sure to please even the most sophisticated palates. You won’t be able to resist our savory pizzas or our creamy pastas. Lovingly made and perfectly seasoned, our culinary creations will have you savoring every last bite. Click here to learn more about our history.